The Vidium was designed by Bill Hearn, and depended on a color modulation system patented in his name. 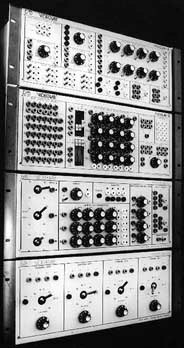 Hearn described the Vidium as a "large console that made complex lissajous patterns. It is an X-Y lissojous display with color modulation designed to follow the contours of the pseudo 3D image. It forms patterns sometimes which are like Escher pictures - that is, impossible objects". It used a color CRT based X-Y display, like an oscilloscope, with sound inputs the signals from which can control the X-Y deflections and the frequency controlling the color. In 1968 Hearn was introduced to people involved with Experiments in Art and Technology and to electronic music composers, and assisted in the building of electronic music synthesizers. Before taking a curatorial position at the Exploratorium, Hearn designed and built the Vidium, which was used by musicians to create images using electronic music signals. The device was made by Hearn's company Color Communications formed with Al Leavitt, who provided much of the financing for the Vidium. Jon Burris summarized the technical operation of the Vidium. "A monochrome X-Y input is decoded in terms of the velocity of the beam in transitions during scanning. A rotating vector (R-Y, B-Y) is decoded so that the X velocity is equivalent to the difference signal in the X amplifier and the Y velocity is proportional to the difference signal in the Y amplifier. The square root of the sum of the squares gives the absolute velocity of the trace. This can be used to modulate the excitation of the RGB guns so that there are produced three bands of modulation: slow = red, for example. This produces various abstract possibilities according to contours of images. Colors seem to be "painted" on the surface according to the form of the "convolutions" of the surface beam velocity." The last Vidium was completed in 1970. There is no documentation on the device. Hearn intended it for use by creative artists and also hopeful about commercial applications, which never materialized. The Vidium was eventually loaned to the Exploratorium, San Francisco. Video Free America members Skip Sweeney, Art Ginsberg and Alan Shulman, asked Hearn to develop a colorizer. VFA probably had a George Brown Colorizer previous to the Hearn. The Hearn colorizer was produced in 1972. It was a multi-level colorizer, based on the concept of cutting the gray scale into zones, with a color and brightness assignable to any gray value. The colorizer was first designed by Hearn's company called Electronic Coop, in partnership with Holly Childhouse. It accepts standard monochrome video signal and provides for generating synthetic four-step color video signal based on 3 adjustable gray scale break points. Brightness, hue and saturation of each gray band are independently adjustable by non-interlacing controls. The output is standard composite video with color burst, which can include any proportion of the original black and white video signal and the synthetic color video signal by means of mixing controls. Sync level is constant on the output regardless of gain settings. Later it was possible to add gen-lock and external subcarrier to the basic machine. About 10 were produced. Hearn and Childhouse renamed the company Electronic Associates of Berkeley. A complete voltage controlled unit with all the features of the Model 100. An additional feature is that each of the steps of the 4 step synthetic video may be selected by an extended digital command. All levels, brightness, hue and saturation levels as well as the 3 gray scale break points may be programmed by external voltages. Model 200A has a complete complement of front panel controls with internal control voltage and external control gain adjustments on each variable. Model 200B has no front panel controls and is completely programmed by external voltages. These models were prior to 1975. Hearn's design and conception of the Videolab grew out of a request from Bill Etra and conversations between Hearn, Etra and Steve Rutt in 1975. The Videolab was a full voltage controlled colorizer, voltage controlled matrix switcher, and included oscillators, specified by Rutt and Etra. Hearn cites the influence of Don Buchla on the architecture of the system. The Videolab is wholistic in design, integrating a number of modules which work together, functioning like a self-contained small production house. Hearn indicates the influence of Don Buchla on the philosophical design. The Videolab System is a highly flexible modular voltage controlled video synthesizer. The function of the Videolab is to accept up to six video images and to provide the user the capability of switching, combining and modifying these images in a wide variety of ways. Some of the image techniques available to the Videolab user include multi-level keys, mattes, fades, dissolves, wipes, multi-level split screens, colorizing, vertical interval switching, and optionally, chroma keying. All special effects, including colorizing, can be done with soft edge keying, if desired. This the EAB Videolab, utilizing patch cords and voltage control, combines in one compact package the functions of Genlock, Switcher, Special Effects Generator, Colorizer and Processing Amplifier. Modules A and B are used together and provide Genlock, Switcher, SEG, and Colorizer features. These units are capable of producing most standard and many novel special effects. Module C interfaces the basic system to any sound source and provides for producing automatic sequences of video effects. Module D produced the Videolab system user with four independent downstream chroma keyers utilizing joystick control. These units are fully color compensated and require no external delay lines. "I think about the person who made organs for Bach, the person who designed and built them. And what I want to do, what I really lust after is to make machines that are so clear to a creative person and give them so many possibilities that it gives them freedom as an artist. It gives me a terrific thrill when I see someone like Ernie Gusella in New York who's doing truly creative work with the Videolab. And it's always in the back of my mind whenever I make a new one - it's like putting keys on an organ - what's the most elegant way of giving tool control to the person who's using it. I get an incredible satisfaction out of the circuit drawings. It's a creative shot in the arm, whenever I sit down and make something new. And you see it all drawn so that it can be easily built. The integrated circuits are all put out in place, right next to each other and the signals can be traced clearly, and to me it's like a creative expression. Bill Hearn in conversation with Woody Vasulka. from the notes of Jon Burris and transcribed conversation between Woody Vasulka and Bill Hearn, work performed through a grant from the National Endowment for the Arts to the Experimental Television Center and Vasulka Corporation , 1978.